Mount Lemmon Observatory (MLO), also known as the Mount Lemmon Infrared Observatory, is an astronomical observatory located on Mount Lemmon in the Santa Catalina Mountains approximately 28 kilometers (17 mi) northeast of Tucson, Arizona (US). The site in the Coronado National Forest is used with special permission from the U.S. Forest Service by the University of Arizona's Steward Observatory, and contains a number of independently managed telescopes. The MLO site was first developed in 1954 as Mount Lemmon Air Force Station, a radar installation of the Air Defense Command. Upon transfer to the Steward Observatory 1970, the site was converted to an infrared observatory. Until 2003, a radar tower operated from Fort Huachuca was used to track launches from the White Sands Missile Range in New Mexico and Vandenberg Air Force Base in California. The 1.52 m (60 in) Steward Observatory Telescope is a Cassegrain reflector used for the Mount Lemmon Survey (MLS), which is part of the Catalina Sky Survey (CSS). It was built in the late 1960s and first installed at Catalina Station on Mount Bigelow, which is nearby in the Santa Catalina Mountains. It was moved to Mt. Lemmon in 1972, and then re-housed in its current location in 1975. Its original metal primary mirror performed poorly and was replaced in 1977 with a glass mirror made of Cer-Vit. It is one of the telescopes used by students at Astronomy Camp. It discovered 2011 AG5, an asteroid which achieved 1 on the Torino Scale. A 1.52 m (60 in) Dahl-Kirkham optical/near infrared telescope began operating in 1970, and is the only instrument at the Mt. Lemmon Observing Facility (MLOF) of the University of Minnesota (UMN). It is of the same general design as the 1.5 m Steward telescope and another at San Pedro Mártir. The original metal mirror performed poorly and was replaced with a Cer-Vit mirror in 1974. The University of California, San Diego (UCSD) was originally a partner of UMN in operating the telescope. A 1.02 m (40 in) reflecting telescope of an unusual Pressman-Camichel design is used by the CSS to provide automated follow up observations of newly discovered near-Earth objects. It was originally located at Catalina Station and was moved to MLO in 1975. It was refurbished in 2008 and placed in a new dome in 2009 before being integrated into CSS operations. A 1.0 m (39 in) robotic telescope installed in 2003 is the only instrument of the Mt. Lemmon Optical Astronomy Observatory (LOAO) operated by the Korea Astronomy and Space Science Institute (KASI). The 0.81 m (32 in) Schulman Telescope is a Ritchey-Chrétien reflector built by RC Optical Systems and installed in September 2010. It is operated by the Mount Lemmon SkyCenter and is Arizona's Largest dedicated public observatory. The Schulman Telescope was designed from inception for remote control over the internet by amateur and professional astrophotographers worldwide, and is currently the world's largest telescope dedicated for this purpose. A 0.7 m (28 in) reflecting telescope installed in 1963 at Catalina Station was moved to MLO in 1972. A 0.6 m (24 in) Ritchey-Chrétien reflector was built by RC Optical Systems and is operated by the Mount Lemmon SkyCenter. The 0.5 m (20 in) John Jamieson Telescope was donated to UA in 1999 and dedicated in 2005. It is optimized for near infrared observing and is operated by the Mount Lemmon SkyCenter. ^ "Air Defense Radar Stations Information for Mount Lemmon AFS, AZ". Online Air Defense Radar Museum. Retrieved 2012-01-16. ^ a b "Mt. Lemmon Infrared Observatory". Astronomy Camp. Retrieved 2012-01-16. ^ "Steward Observatory 60" Telescope". University of Arizona Department of Astronomy and Steward Observatory. Retrieved 2012-01-16. ^ a b Sonett, C. P. (1976). "University of Arizona, Department of Planetary Sciences and Lunar and Planetary Laboratory, Tucson, Arizona. Observatory report covering the period from 1 October 1974 to 30 September 1975". Bulletin of the Astronomical Society. 8: 11. Bibcode:1976BAAS....8...11S. ^ Hubbard, W. B. (1978). "University of Arizona, Department of Planetary Sciences/Lunar and Planetary Laboratory, Tucson, Arizona. Report from 1 October 1976 to 30 September 1977". Bulletin of the Astronomical Society. 10: 16. Bibcode:1978BAAS...10...16H. ^ "Camp Facilities and Telescopes". Astronomy Camp. Retrieved 2012-01-16. ^ "UMN Infrared Astronomy: Mt. Lemmon Observing Facility". University of Minnesota Department of Astronomy. Archived from the original on 2012-02-10. Retrieved 2012-01-16. ^ Ney, E. P. (1975). "University of Minnesota, Minneapolis, Minnesota. Observatory report". Bulletin of the Astronomical Society. 7: 150. Bibcode:1975BAAS....7..150N. ^ "MOUNT LEMMON OBSERVING FACILITY". University of California, San Diego Center for Astrophysics & Space Sciences. August 17, 2006. Retrieved 2012-01-16. ^ Stiles, Lori (January 7, 2009). 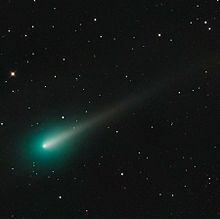 "Catalina Sky Survey Sets New Record for NEO Discoveries, Receives Funding Through 2012". The University of Arizona Office of University Communications. Retrieved 2012-01-16. ^ Han, Wonyong; Mack, Peter; Lee, Chung-Uk; Park, Jang-Hyun; Jin, Ho; Kim, Seung-Lee; Kim, Ho-Il; Yuk, In-Soo; Lee, Woo-Baik; et al. (2005). "Development of a 1-m Robotic Telescope System". Publications of the Astronomical Society of Japan. 57 (5): 821. Bibcode:2005PASJ...57..821H. doi:10.1093/pasj/57.5.821. ^ a b "Arizona's Largest Public-Only Telescope Now at UA's SkyCenter". The University of Arizona Office of University Communications. October 22, 2010. Retrieved 2012-01-16. ^ "RCOS: 32 inch Carbon Truss Telescope". RC Optical Systems, Inc. Retrieved 2012-01-16. ^ "Mount Lemmon SkyCenter Astronomer Takes 'Astronomy Picture of the Day'". The University of Arizona Office of University Communications. August 19, 2008. Retrieved 2012-01-16. ^ "RCOS: 24 inch Carbon Truss Telescope". RC Optical Systems, Inc. Retrieved 2012-01-16. ^ Stiles, Lori (November 18, 2005). "Jamieson Telescope Will Light Infrared Universe for Amateur Astronomers". The University of Arizona Office of University Communications. Retrieved 2012-01-16. Wikimedia Commons has media related to Mount Lemmon Observatory. Mt. Lemmon Observatory Clear Sky Clock Forecasts of observing conditions. This page was last edited on 13 November 2018, at 01:10 (UTC).